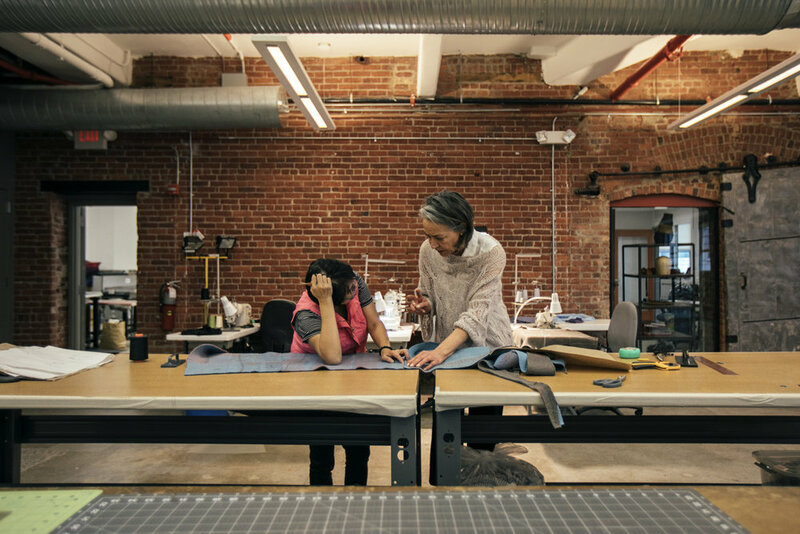 In 2018, clothing designer Eileen Fisher and her longtime collaborator, artist Sigi Ahl, debuted Waste No More, a design studio dedicated to making artisanal textiles from post-consumer clothing. Waste No More was born out of R&D that began when EILEEN FISHER launched its clothing take-back program in 2009. The brand was faced with finding a scalable way to repurpose the clothes it could not sell in order to realize its vision for a circular model of design with zero waste. Through years of experimentation, Ahl developed a new technique based on the age-old practice of felting. Ahl and her collective of artists, designers and seamstresses have transformed an industrial technology—which has so far been used mainly for large-scale textile production, such as insulation—into a design instrument. The felting machine operator becomes a maker, bringing her artistic sensibility to the process. Using the damaged garments as a palette, the operator curates materials, intuitively layering and manipulating shapes to create one-of-a-kind textile paintings, acoustic panels, pillows and other products. The very nature of garment waste as a source material demands a different approach to design. There is no cutting room floor—all elements of the clothes are used, or saved until a future use can be discovered. Textiles that degrade in the felting process are celebrated, their destruction incorporated into the aesthetic. The randomness of the waste stream—rising and falling tides of colors, fibers and construction—demands that the architects and designers who source felted works allow for a degree of chance. And that they see the beauty in the unique outcome of a project. We hope this can be a new model for the textile industry—one that leads away from unsustainable consumption and toward a future without waste. Garments are collected and sorted according to material content at our Tiny Factory, in Irvington, NY. Some damaged garments are used whole in the felting process, clearly revealing the story of their past. Many are deconstructed, and the materials used for more abstract compositions. Everything is saved—either to be used in another project or held for a yet-to-be-discovered purpose. The materials are intuitively arranged and layered by the artisan who operates the felting machine. They’re felting using a small-batch needle-punch machine—a process that uses no water, little energy and has virtually no environmental impact. The work that emerges—made only from waste material—blends the colors and fibers into something wholly new.